Son of an RAF career pilot, Deacon’s work has often been com¬pared to machine parts or the skeletal frames of gliders, hangars or other paraphernalia associated with aviation. 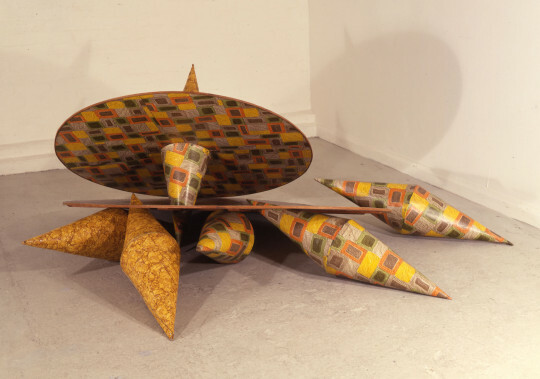 In the early 1980s, he began making sculpture which employed swelling, curvilinear forms made from laminated wood, galvanised steel, corrugated iron, cloth and linoleum: materials which were serviceable, readily to hand and not burdened with the weight of sculptural tradition or preconceptions. He has described himself as a fabricator (‘material and manipulation are core ideas in what I do’, explaining that he neither carves nor models his materials, but constructs them. The steel rivets, bolts and rough sur¬faces become part of the final form, reinforcing a sense of the material being manipulated into shape. Despite their debt to industrial processes, the results are surprisingly organic-looking, with, typically, undulating forms that snake into themselves like giant pencil shavings or a DNA double helix. In addition to works of a domestic scale, such as Boys and Girls (come out to play), Deacon has also undertaken a large number of public commissions, many of them inspired by the landscape. The large sculpture Individual (2004), for example, began with an aerial pho¬tograph he took of the River Tay in Scotland, twisting like a tapeworm through the countryside. Other works begin as doodles on paper and appear to grow like vapour trails, the artist attempting to keep them constantly in a state of transition and flux, full of potential that is never fixed or pinned down. A prolific writer, Deacon compares sculpture to the spoken word and considers the space in, around and between a sculpture similar to a conversation, with its own rhythms, metaphors and cadences. ‘I think of making things, structuring, as being an activity not unlike the power of speech, in that it is a means of giving shape … its obviously not in the same order as language, but it’s a means whereby the world, a chaotic universe, is actually made understandable.’ He also plays a subversive game with scale, often titling his works using puns, proverbs and nurs¬ery rhymes, creating a surprising intimacy between the sculpture and the viewer. Deacon has spoken of Sigmund Freud’s theories of play, as outlined in Beyond the Pleasure Principle (1920), in which Freud claims that imitative play is a means of mastering the environment around us. Deacon’s playfulness in scale, structure and fabrication is brought out in full in a work such as Boys and Girls (come out to play), which was partly inspired by the birth of his daughter. It is made of plywood and wrapped in functional patterned lino featuring a durable Modernist design in yellow, orange and brown. The sculpture resembles a group of discarded and broken spinning tops on the gallery floor, abandoned for more lively pleasures. A later work by Deacon in the British Council Collection, Allsorts (2003), is a reprise on the theme of interlocking circles, a witty cat’s cradle in shocking pink. With its interlacing of high-fired ceramic coils, Allsorts sits on the floor like a bright new totem, shot through with holes, and reaching for the skies.
. Quoted in Turning Points: 20th Century British Sculpture (Tehran: Tehran Museum of Contemporary Art, 2004), 48.
. Marion Goodman Gallery, New York.
. Quoted in Turning Points, 48.